As an institution, the supergroup has an uneven history, particularly in terms of artistic success. When 4 Jacks formed, therefore, the band at once faced a challenge of sorts. The Washington, D.C.-based Big Joe Maher is here, singing and drumming as he does in his own band, the Dynaflows. Texan Anson Funderburgh, who led The Rockets for many years, is widely considered to be one of the most tasteful guitar stylists and tone kings working in blues. The Nashville keyboard ace Kevin McKendree, who has worked with both Maher’s Dynaflows and Funderburgh’s Rockets, is perhaps best known as a member of Delbert McClinton’s band and has also recorded and toured with Brian Setzer; among his many credits are projects with Lee Roy Parnell, Tinsley Ellis, Robert Ward, Tad Robinson, Seth Walker, and Watermelon Slim. Steve Mackey, another session veteran and McClinton band member, holds down the electric bass chair. Obviously the 4 Jacks bring with them a history of high standards. Deal With It more than lives up to expectations. The jumping little number “Have Ourselves A Time” swings hard, with Maher smoothly delivering a good-time invitation and Funderburgh combining cunningly bent notes and clipped phrases. “She Ain’t Worth A Dime,” a rowdy shuffle very much in the style of J.B. Lenoir’s “Mama Talk To Your Daughter,” features a rippling piano solo and an enthusiastic vocal. The wry “Bobcat Woman” describes a certain type of disagreeable lover who will be familiar to any regular blues listener. Featuring McKendree on organ, this Texas shuffle will be a tonic for Rockets fans waiting for Funderburgh to uncoil his patented, stinging leads. Maher’s fast “Thunder And Lightning,” working off of the framework of “Feel So Bad,” is another showcase for Funderburgh’s staccato lines. The stark, Latin-tinged “Love’s Like That,” a minor key piece, hinges on Mackey’s bass guitar figure and Maher’s tom-tom rolls. McKendree’s chords and single-note rolls are impeccably timed; Funderburgh squeezes out perfect notes and phrases almost stingily; and the vocal is subdued, almost downcast. It is superb. The assuredly paced slow blues “Your Turn To Cry” is arranged with both piano and organ; chord substitutions give it a more sophisticated feel than Otis Rush’s familiar version. Another slow number, “Bad News Baby,” features beautiful interplay among the band members and a sublime guitar break. The Jacks play it superbad and funky on the Percy Mayfield composition “I Don’t Want To Be President,” with wiry guitar and a friendly, very funny vocal performance. Maher’s spoken introduction and vocal on “Ansonmypants” are as playful and spirited as The Big Bopper’s on “Chantilly Lace.” Here McKendree solos on piano and dials in a roller-rink organ sound, while Funderburgh shifts into T-Bone Walker mode. Three instrumentals round out the program. “Texas Twister” combines blues and R&B in the fashion of Freddy King’s classic instrumentals, and is every bit as catchy; your mind’s eye may well see go-go dancers. The title track has more than a hint of King in its hook, but takes on a definite Stax flavor once McKendree solos, with the drawbars set to give the organ that unmistakable, slightly hollow tone so characteristic of Booker T. At the end of the playlist, “Painkiller” evokes The Meters’ funk with clever syncopation and a “Cissy Strut”-like design. Pieces like these present a case study in how four truly hip parts can interlock seamlessly, when great individual players are also great ensemble players. More importantly, they are downright fun to listen to. 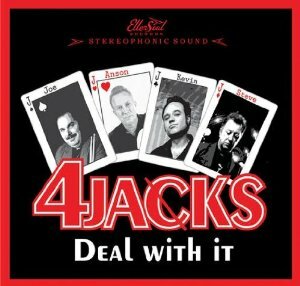 4 Jacks sound like they are having an uncommonly good time making music–their feel is always right on target. An exciting survey of blues and R&B styles, Deal With It never comes close to striking a false note. Highly recommended. Review copy provided by Frank Roszak Radio Promotions.